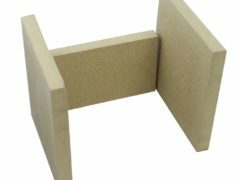 Replacement stove fire bricks for wood burning multi fuel stoves cookers and pizza ovens. Simply enter the height and width of the brick required into our stove fire brick calculator. Stove liners, which are often known as fire bricks, are removable panels that sit against the left side, right side and back of the firebox in your wood-burning stove. Their purpose is to protect the stove’s metal bodywork from the intense heat generated by the appliance. Given that the flames are instead licking against the stove liner, these panels are susceptible to wear and tear and may need to be replaced. Heat / Fire Resistant suitable for lining wood burning stoves or kilns. High Density as such high quality and durable. Can be cut with a wood saw or jigsaw blade to suit. Micalite™ boards are also available with decorative surfaces including Brick effect, Herringbone and Reeded patterns making them ideal insulation panels for inglenook. Used for re conditoning your stove.